Fairmont Royal Pavilion is a luxurious hotel which is located beside one of the finest beaches on the west coast of Barbados in the charming parish of St James. Offering excellent service and fantastic facilities, the boutique property is an exclusive hideaway which is perfect for couples and families. Fairmont Royal Pavilion has recently been renovated to enhance the elegant architecture while maintaining a colonial style. It offers 72 luxurious guest rooms including beautiful ground floor suites with access to the beach’s white sand and rooms with balconies overlooking the turquoise water of the Caribbean Sea, plus a three-bedroom villa within the hotel’s lush tropical gardens. All rooms are extremely comfortable with daily buffet breakfast, airport fast track, cutting-edge technology, warm interiors, furnished outdoor spaces where guests can relax or dine in private. Guests staying in the Signature Oceanfront, Beachfront Suites & Villa enjoy an exclusive butler service with evening canapes and luxury airport transfers. There are two restaurants at Fairmont Royal Pavilion as well as the casual Beach Club which serves light lunches and drinks. Palm Terrace Restaurant is open year-round for breakfast and seasonally for dinner and has a reputation for its excellent international cuisine and locally inspired menus, often accompanied by performances by local artists. Taboras Restaurant is poolside and offers lunch and dinner. Guests can also enjoy complimentary afternoon tea once per week. There is also a private dining option where guests can relax on their own balcony or terrace with butler service. In addition to half a mile of superb beachfront, a freshwater pool and a Jacuzzi, there are complimentary non-motorised watersports on offer such as sailing, kayaking and snorkelling trips to swim with the turtles*. Scuba diving, fishing and boat trips are also available locally. A fitness centre and a flood lit tennis court are in the grounds and guests have access to the exclusive Royal Westmoreland Golf Course. In-room spa treatments are available, especially popular at sunset on the balcony of an Oceanfront Room. 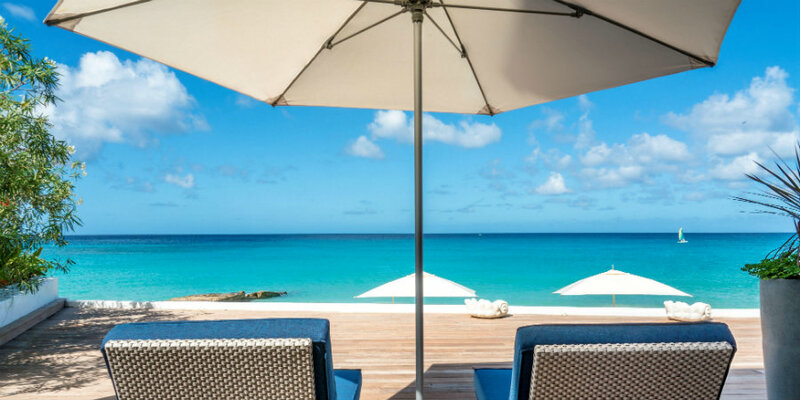 This luxury hotel can quite comfortably boast one of the best beachside locations in Barbados. Here you can book your holiday knowing that no matter what room you get you will have the best possible view of the turquoise Caribbean Sea. The rooms and suites are located in three level blocks which run parallel to the ocean, the Beachfront Suites being located on the ground floor with the Luxury & Signature Oceanfront Rooms above. The Beachfront Suites have unbeatable access to the beach, as you step off your large terrace onto the white sand. The Luxury & Signature Oceanfront rooms above are ideal for those who would like the best possible views of the gorgeous sea with the added privacy of being upstairs. For families, the hotel can book interconnecting rooms and ensure you are not split up. This relatively small hotel feels spacious and has two great restaurants, both beachside of course, Palm being perfect for breakfast in the mornings and fine dining in the evenings seasonally and Taboras for high quality yet informal dinners and lunches. Do try to drag yourself away from this resort at least once to visit one of the many nearby restaurants, one of the friendly staff can recommend something to suit you. For more information about Fairmont Royal Pavilion or alternative properties, take a look at the Barbados Trip Diary or call us on 01752 880 880.